A Literary Odyssey: Book 29: Finished. It makes to so happy to read your review, because I loved this book as much as you. I am always happy to meet other Atwood lovers, as she is truly one of my favourite authors. No one can create characters and a mood and a story like Margaret Atwood can. It has been awhile since I read this one of hers, but I might have to re-read it. 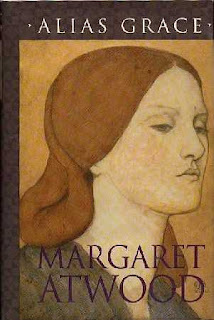 Although I have 'Surfacing' at home by Margaret Atwood that I still haven't read yet. I agree with you that the way Atwood created Grace was special. You couldn't help but feel for her and her situation. Its a useful reminder that good people can do bad things, something I am reminded of in my daily work and I think that other people need to remember too. This was an unexpected hit with my book club in Feb. We were all blown away by Atwood's skill in creating a realistic 19th century woman's voice, and with the way she slowly brought the story and the characters to life. I'm definitely in the Atwood camp now! I LOVED this book too! Read it when it first came out in hardcover. I was working at the bookstore and I put it on Staff Recommends and moved a lot of copies. Then last year I convinced my book club to read it so I actually reread it (which I almost never do with adult books these days unless it's a book club book and it's been 10 years since I read it.) It was just as good as I remembered! And Becky, Surfacing is really good. That's the first Atwood that I read, in college. I need to read another of hers.